Explore and learn on every side! Learn and play every day with the Turn & Learn Cube by VTech! 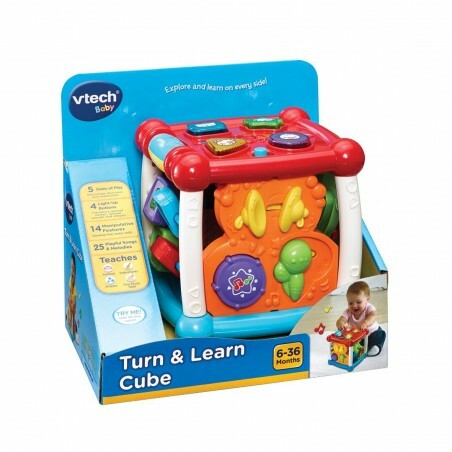 Featuring 5 sides to explore, this activity cube attracts your baby’s attention with music, chunky light-up buttons, bright colours and more. Light-up buttons introduce animals, animals sounds and shapes. Press or slide the musical instruments to hear their name and sounds, also includes 5 sing-along songs and 20 fun melodies. 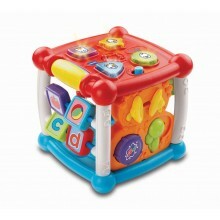 The cube also features lots of sliding and spinning manipulative features to encourage interaction and a motion sensor that triggers fun sound effects. 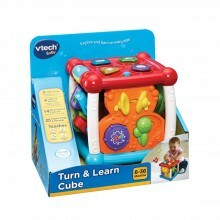 Encourages motor skill development, imaginative play and language development.